Trade ministers from South Africa and Saudi Arabia jointly inaugurated the Bokpoort Concentrated Solar Power (CSP) Project, which has been developed by a consortium led by ACWA Power in the Northern Cape Province of South Africa, marking the official launch of the 5 billion South African rand ($327.9 million) project. Rob Davies, South Africa's Trade and Industry Minister and Dr Tawfig Fawzan Alrabiah, Saudi Arabia’s Minister of Commerce and Trade officiated at the ceremony, at the site, which will provide enough power to supply more than 200,000 homes. The project was developed as part of the government’s Renewable Energy Feed in Tariff (REFIT) Procurement Programme, and will contribute significantly to the government initiative to augment much needed power capacity, attract foreign direct investment, and create jobs while also stimulating the country’s economy. 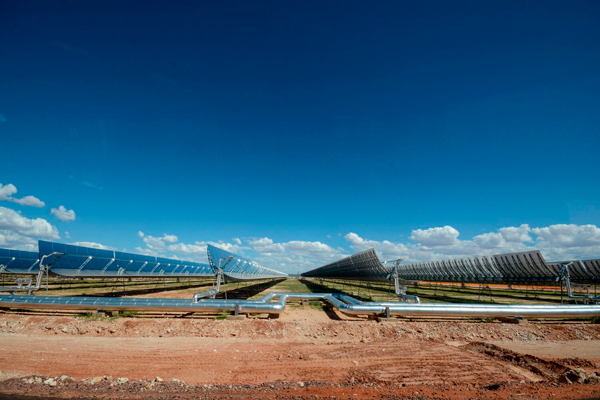 The tariff offered by ACWA Power at the second procurement window was 12 per cent lower than the cap set by government for CSP technology at that round; in line with ACWA Power’s mission to deliver reliable power at the lowest possible cost, thereby contributing to the economic development of South Africa and social welfare of its citizen. Mohammad Abunayyan, ACWA Power chairman, said: “The formal inauguration of the Bokpoort CSP plant is a significant milestone in supplying South Africa with reliable and cost competitive renewable electricity. “We see this as the start of an enduring partnership with South Africa to augment the foundation for economic growth and social development” he added. Equipped with more than nine hours of thermal storage capacity, the Bokpoort CSP plant operates like a giant rechargeable battery. This unique utility scale storage system allows this power plant to feed over 200,000 South African households with electricity during the day and night. Bokpoort CSP is utilising the only reliable renewable technology available to South Africa today at a commercial scale to cover the country’s daily evening peak demand from five pm to nine pm, which is crucial for increasing sustainable supply for Eskom, the South African public electricity utility. Chris Ehlers, the company’s managing director for the Southern Africa region, said: “We are here to serve the nation and to contribute to its development. Our commitment to the development of South African economy beyond reliably supplying renewable energy at a cost competitive tariff is demonstrated by the R2 billion worth of locally sourced components made in South Africa that has been used in the construction of this plant and the creation of 1,300 construction jobs.